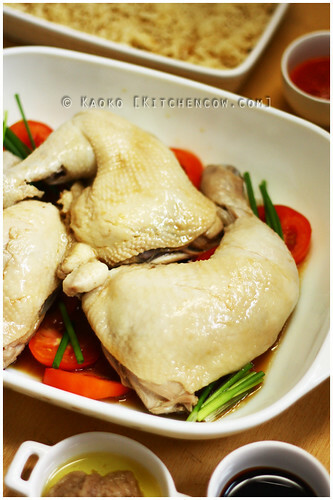 Truth, I still wouldn’t try cooking it, but when the people from Prima Taste, a Singaporean company that specializes in food mixes for Singaporean dishes sent over a selection of products, I shrugged and decided to give Hainanese chicken a try. For something that comes in a box, it seemed complicated at first. There were a gajillion little packets, but after a quick inspection, I realized that the actual cooking was pretty straightforward and the techniques needed were pretty basic. I started off with rubbing some chicken legs with salt. It’s not in the instruction sheet, but I read that preparing the chicken that way before cooking helps, so I tried that. The Prima Taste flyer recommends using a whole chicken, but with my zilch chicken butchering skills, I opted to buy a couple of legs instead. With that extra step done, I boiled some water and added seasoning packet #1. That one surprised me because (1) it was liquid, (2) it had real pieces of garlic and green onions. Not what I expect from a mix. After it started boiling, I added the chicken and let it simmer until done. I followed this up with an ice bath to make the skin go taut and to arrest the cooking. 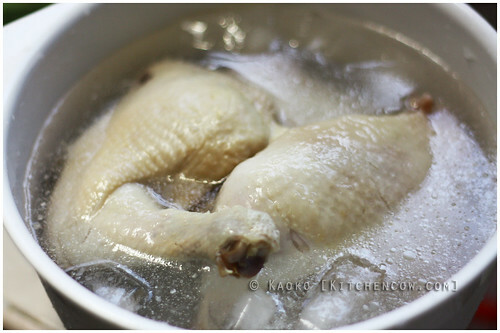 Overcooking is Hainanese chicken’s enemy, so the ice bath is essential. It sounds complicated, but it’s really just dumping your chicken in a bowl of ice water. 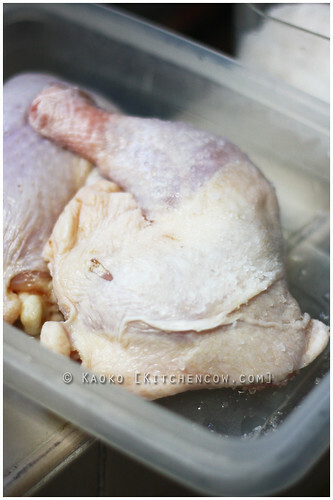 Handle the chicken gently as the skin tears easily. Now here’s a fancy (ice) bath. After that, I prepared the Hainanese chicken rice using the leftover stock from poaching the chicken and seasoning packet #2. Again, this was pretty simple. I just washed some Thai jasmine rice, then dumped everything in the rice cooker. They have instructions for cooking the rice on the stovetop, but I’m Pinoy and we have a rice cooker, so it’s just one button press for me. The rest of the seaoning packets are your traditional Hainanese chicken sauces: dark soya, grated ginger, and chili sauce. This was really a relief. While it’s probably doable to poach the chicken from scratch, it’s creating sauces that taste authentic that daunts me the most. 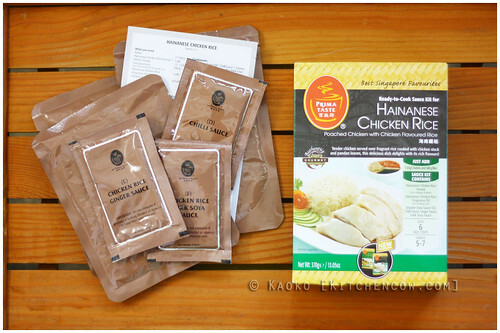 Thankfully, this Hainanese chicken rice kit takes the guess work and ingredient sourcing out of the equation. The last step for prepping the chicken involved heating up the soya oil packet and pouring it over the poached chicken. All that’s left after that is setting the chicken, rice, and the necessary accouterments on the table and digging in. Was it good? Yes. It tasted like authentic Singaporean Hainanese Chicken Rice and I got it right the first try. It was easy too. All you need to know is how to boil and how to use a rice cooker. Easy enough and the results are quite delicious. If you’re having guests over and want to impress them with your kitchen skills, this is a good dish to try. Aside from the Hainanese Chicken Rice, Prima Taste also has other Singaporean seasoning kits like Laksa, Mee Rebus, and Satay. I haven’t gotten around to cooking those yet, but I’ll be sure to share my results when I do. 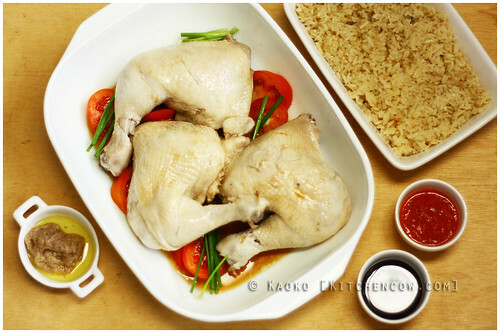 In the meantime, let me leave you with dreams of Hainanese chicken rice. Kitchen Cow was given a selection of product samples for testing. No monetary compensation was received. All opinions and photos are writer’s own.